Keane provides custom-tailored unclaimed property services to serve a variety of industries, including banks, brokerages, insurers, mutual funds, and public corporations. Each of our core capabilities can be specialized to fit the specific needs of the individual company and industry. As the only comprehensive provider of unclaimed property services in the country, Keane offers customized programs that will help your organization comply with state and federal rules, while protecting assets and strengthening customer relationships. In today’s challenging economic environment, it simply costs too much to lose customers and their accounts to escheatment – and it can cost more to struggle to stay in compliance with the constantly changing unclaimed property laws. With states conducting an unprecedented level of unclaimed property audits, many operations teams are finding that they’re stretched too thin and lack the specialized resources and knowledge to ensure full compliance with the various state laws. Keane is the leading expert that public corporations rely on to avoid the escheatment of shares and provide the highest level of customer service to corporate issuers and their shareholders. Keane has been rated the number one provider of lost shareholder search and asset recovery services for the fifth consecutive year by consulting and corporate services research company, Group Five. We perform proprietary data analysis of investor data and improve record accuracy. Our communications programs are highly successful at motivating responses from individual shareowners and beneficiaries of estates. Throughout our efforts to reconnect our clients with their lost accounts we maintain the highest concern for each corporation’s reputation and have industry leading satisfaction scores as a result. Our best practice solutions can reduce costs, minimize escheat, and improve shareholder satisfaction. With increased frequency, states are relying on enforcement of unclaimed property laws to raise revenue. Compliance is mandatory, and penalties and interest charges can be significant depending on the individual state jurisdiction and the level of noncompliance uncovered during an audit. Banks may even be responsible for audit costs. Keane is the leading unclaimed property firm in the nation, uniquely qualified to conduct various levels of notification and searches to find lost and inactive customers. We have protected hundreds of millions of dollars in customer assets from escheat for banks and credit unions. Keane specializes in dormant accounts and can even identify owners of abandoned safety deposit box contents. We reduce risk, improve compliance, and strengthen consumer relationships for financial institutions.  Insurance companies are required by state unclaimed property laws to conduct various levels of notification and searches to find lost and inactive customers. Keane is the leading provider of unclaimed property services and offers unrivaled location, identification, and communication programs for annuity and insurance companies. By finding and galvanizing annuitants and beneficiaries to act, Keane helps our clients protect assets from escheat and ensures proper payment of claims. Keane helps insurers reduce expenses while simultaneously retaining customers and enhancing reputations. Lost or missing participants are cost and operational concerns for retirement plan sponsors and administrators. Keane’s participant location and communication services are designed to address these concerns and allow providers of both defined contribution and defined benefit plans to ensure compliance with federal regulations such as ERISA, administrative guidance from the Department of Labor, and the requirements of each individual retirement plan. Keane helps brokerage firms revitalize dormant accounts, reduce audit exposure for unclaimed property, and ensure compliance with SEC 17Ad-17 and the Dodd-Frank act. Keane helps our clients avoid escheat, but more importantly we transform lost shareholders into satisfied customers. By locating and retaining investors our clients reduce compliance exposure, avoid escheatment of assets, and enhance their reputations for customer loyalty. We locate customers and heirs, offer check clean-up programs, customize mailing and verification programs, proactively limit fraud. Keane pioneered investor data innovation for the mutual fund industry. Our Investor Data Quality (IDQ) analysis rewrote the book on proactive asset retention efforts. We can work seamlessly with transfer agents and deliver unmatched results for uncovering exposure, enhancing compliance, and reducing risk. We offer free initial analysis and help mutual fund compliance officers, operations management identify red flags and hidden risks. And no organization has a better track record for reconnecting clients with their shareowners. Exclusive property types such as mineral interest proceeds and royalty payments, coupled with varying state laws and current pay statutes makes unclaimed property compliance a difficult task for many Oil & Gas companies. Our full suite of tailored unclaimed property services helps energy companies comply with state unclaimed property laws, locate lost royalty and mineral interest owners, and mitigate audit risks in an efficient and cost-effective manner.